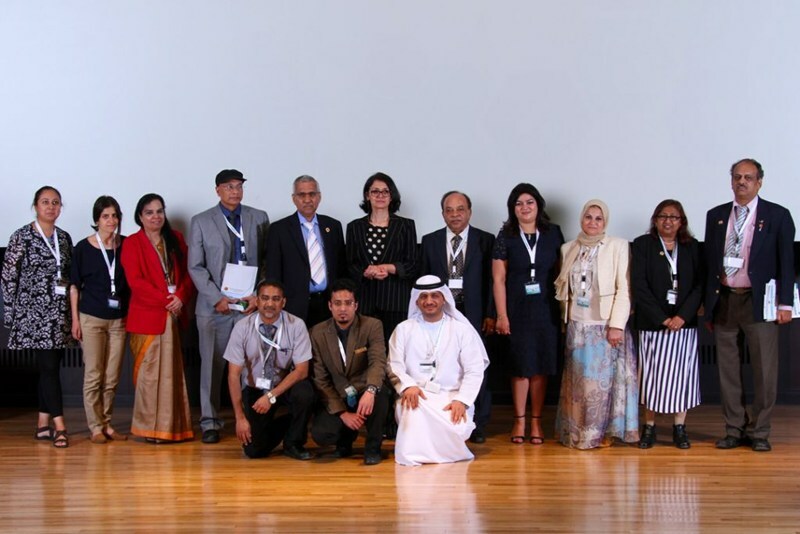 Attended the conference are Dr. Shereen Hamada, Senior Scientific Coordinator, Hamdan Medical Award, Dr. Stephany Al-Hayek, Senior Scientific coordinator, the award’s Center for Arab Genomic Studies (CAGS), Pratibha Nair, Senior Researcher, CAGS, and a number of the university’s officials, graduates and students. Dr. Shereen Hamada delivered the award’s speech, and pointed out to the award’s support for this event as one of the most important elements of the conference’s success throughout the previous years. “This support comes out from the award’s keenness on encouraging the innovative scientific initiatives by young researchers within the UAE, in order to build a new generation of specialists capable of developing the medical sectors to meet future challenges”, she added. The conference was concluded with announcing the names of the winners. Regarding the RAKMHSU’s special innovation prizes, it has gone to 4 presentations namely; “Full-Mouth Teeth-Brush” by Rahaf Ehsan Samhouri, “3D Printing Prosthetics” by Muhammad Bassel Darwish, “Innovative Approaches to Minimize Difficulties in Hydrogen Production from Water” by Mohammed Bassam Shehada, and “Programming Medically” by Noura Khaled Sahyouni. Regarding the Oral Presentation for Graduates category, the 1st prize was given for the research entitled “Study of The Prescription Pattern of Proton Pump Inhibitors (PPIs) and Adverse Drug Reactions (ADRs) in The Medicine Department of a Secondary Care Hospital, Ras Al Khaimah, UAE”, by Sukaina Damji. In the Oral Presentation for Undergraduates category, the research entitled “Impact of Life Stresses on The Psychological Empowerment of Medical Students in RAK COMS” done by Rohma Malik, Emranur Rahman, Syeda Nazneen,and Dima Lotfie, won the 1st prize. The 2nd prize was given for the presentation entitled “Evaluation of Zika Virus Disease Awareness Among the Future Healthcare Providers”, by Farhan M Abdul-Aziz, Tasneem M Osama, Itaf A D Mohamad, and Nada TA Fattah. The 3rd prize was given to the presentation entitled “The Effect of Color on Emotions and Disease” by Sreya Varanasi, Mandalaparthi Soumya, and Shriram Gunasekaran. A Pilot Study entitled “Impact of Flipped Classroom in Understanding Musculoskeletal Anatomy” won the 4th prize, and another one entitled “Chemical Analysis for Sage Salvia Officinalis Lamiaceae Via Sepacore X10/X50 System” won the 5th prize. Regarding the poster presentations category, the 1st prize won by the study entitled “Vitamin D Deficiency and Type 2 Diabetes Mellitus - Are They Interdependent?”, conducted by Ummulkiram Asif Khambati, Sana Junaid, and Riddhi Sharad Jadhav. The 2nd prize was for the presentation entitled “Stem Cell Transplantation: Hope for Thalassemia Patients”, by Fahad Mulla, Vaishnavi Bose, Sana Fathima, and Dany Raja Kumar. The 3rd prize was for the study entitled “Increasing Incidences of Polycystic Ovary Syndrome” by Aiman Rizvi. The 4th prize was given to the research entitled “Role of Epigenetics in The Treatment of Cancer”, by Shria Sadhu, Roomiyah Assadi, and Ayesha Khan. The 5th prize was given to a Review of Literature entitled “Effects of Type 2 Diabetes Mellitus On Cognition”, by Fatema Chowdhury, Samiha A Hossain, Reshme R Ahamed, and Fathima Farzana. The 6th prize was given to the study entitled “Ozone Therapy” by Zoubida Zagane and Amani Alzamel. Also, a video entitled “Nightmares” was selected as the best video presented during the conference. The video was produced by Muhammad Saad Asghar, Martin Joseph, Berk Muhammed Altinoz, Emranur Rahman, Rashid Latheef, and Qassim Abdulrazzaq.